Domestic workers are one of the most vulnerable workers in the world, being often the targets of physical and sexual abuse and experiencing discrimination and marginalisation with regard to pay, working conditions and legal rights. One of the sources of vulnerability of domestic workers has been lack of rec-ognition as workers and thereby inadequate legal protection of their rights. 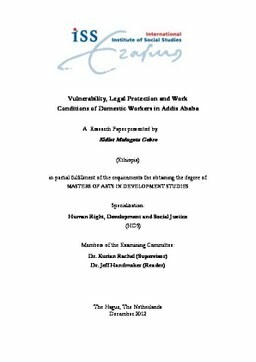 This study investigates the working conditions and available legal protection of domestic workers in Addis Ababa, Ethiopia focusing on the Megenaga area of Yeka-sub-city found that these domestic workers in the study area had little or no labour rights or protection: they rarely had clear contractual relations, worked long hours of work, had little or no privacy and were exposed to ver-bal, physical and sexual harassment. In addition, they often had inadequate food and accommodation and low pay. Domestic workers are however excluded from the labour law of the coun-try and also ignored in the list of special groups in the national women policy of the country. At the same time, the country has ratified CEDAW and is party to the ILO convention 189 (although yet not ratified and domesticated). The paper argues that it is the lack of political commitment among the state, sys-tematic restriction by the state on the civil societies that advocate for domestic workers rights, and limited capability among domestic workers themselves due to illiteracy and poverty that are the main contributing factors for domestic workers agony and silence on their problems.